Are your garage looking like a dump? For many, cleaning and organizing the garage is a terrible task. It just feel like there’s so much stuff in there that it’s impossible to clean anything up! 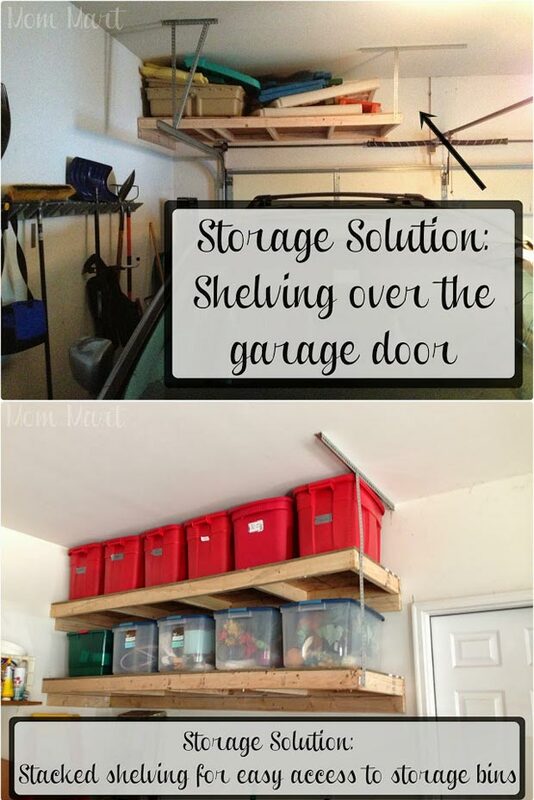 Fortunately, after searching on the internet, I have found a few simple storage ideas and clever tips, you can keep your garage clean and organized. 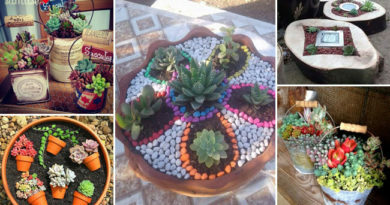 I’ve picked the best 20 ideas from them. They are easy and effective, many of them will cost you nothing but a little time. 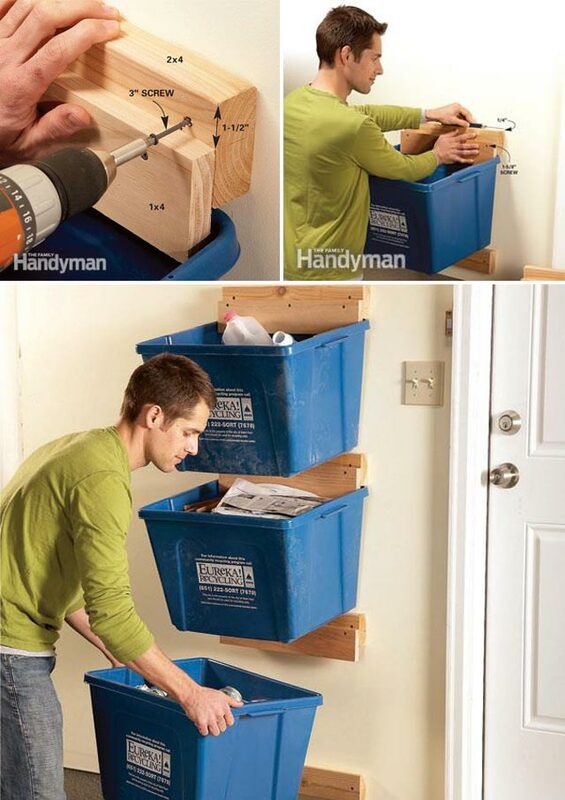 Instead of stacking them on top of each other, the holder will get recycling bins up off the floor and make you easy to access and remove them. The details tutorial is available here. Store your summer furniture on the roof of the garage so its protected year around from the weather! The image source found here. 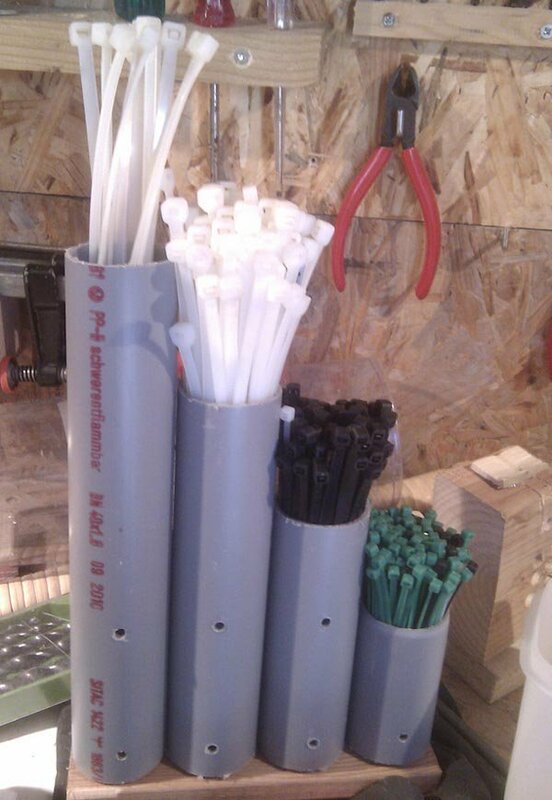 Use a bit of waste pipe and a couple of screws to make a simple storage for mastic tubes. The image source found here. Sliding locks can keep the wheelbarrow standing up against the wall, and screw hooks can also work as wheelbarrow latches. Get the details here. 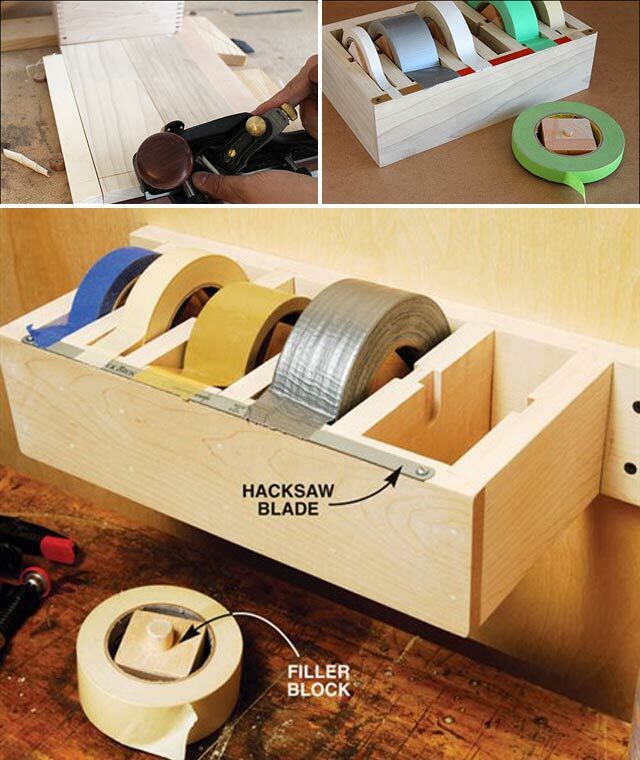 Use scrap lumber to make the dispenser and use a dowel to hold the different kinds of tapes. A hacksaw blade on the front panel serves as the tape-cutting edge. See the full tutorial at popularwoodworking.com and leevalley.com. 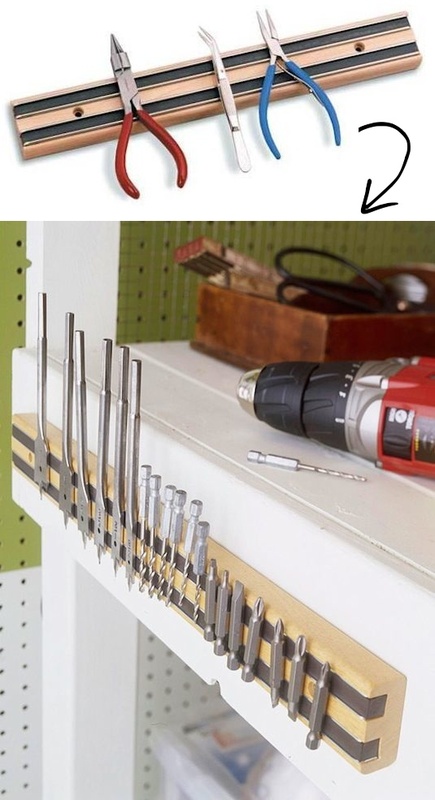 Making a magnetic tool bar in the garage can let you easily access your tools. 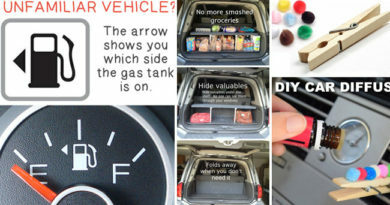 You can diy it or get it on amazon. The image source found here. See the full instructions here! 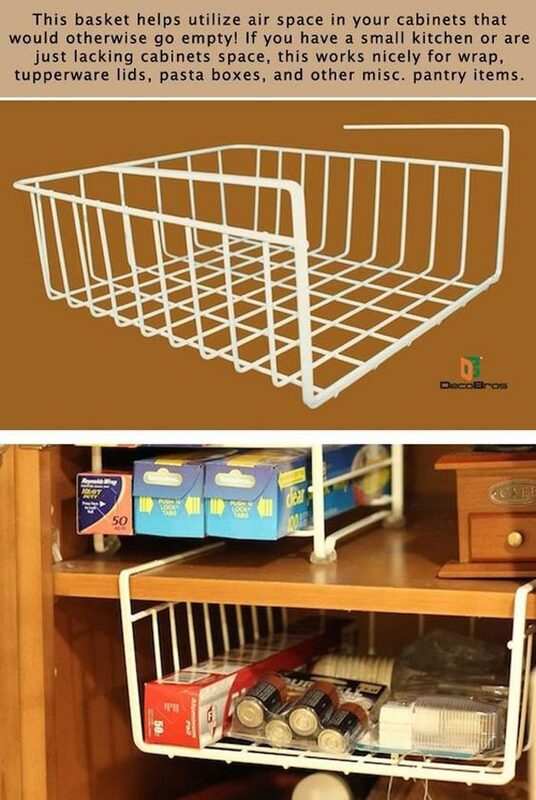 This basket helps utilize air space in your cabinets that would otherwise go empty. They are clever ways to organize the nails, screws and other little miscellaneous things in your garage.Whether plastic bottles or mason jars, they can be easily turn to storage jars and are not taking up counter space. With this genius trick, you will never lose a ball again. Use bungee cords to easily store sports balls! The image can be found here. 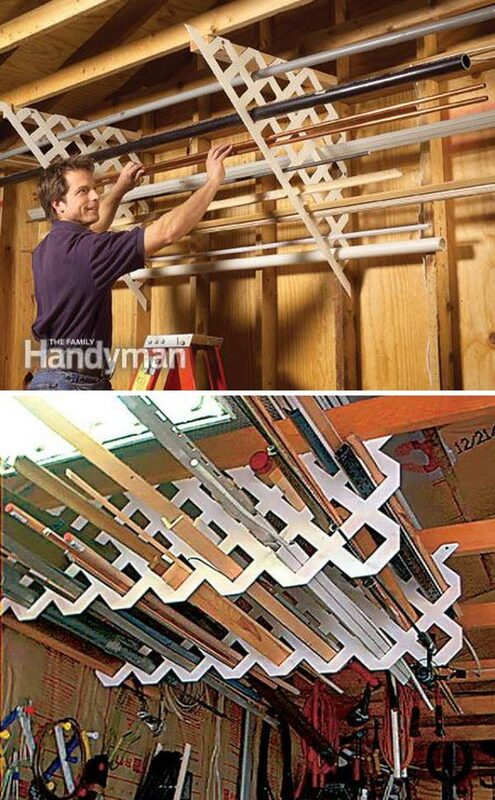 Just require scrap lattice and screws, you can build a lattice rack to store those long lengths of pipe, trim and conduit. Check out the project details here. 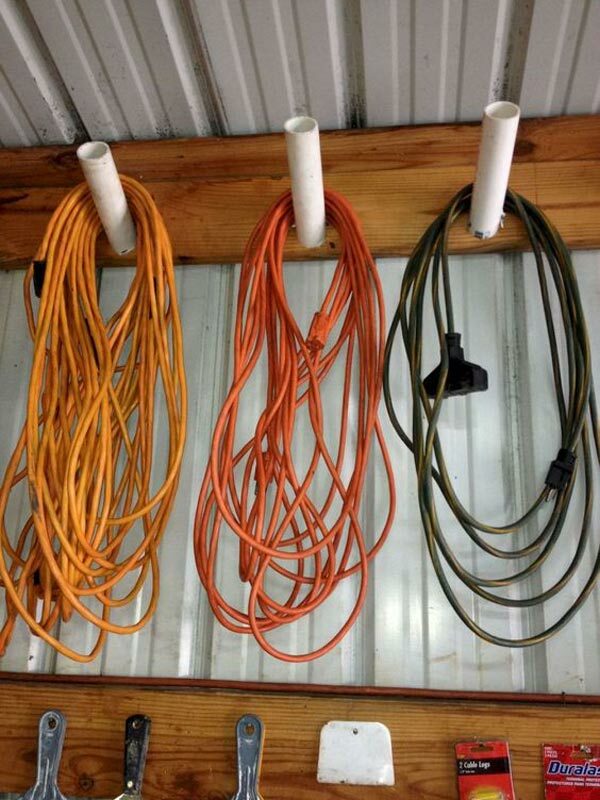 Hang cords on PVC pipes to keep them tangle-free and easy to access. 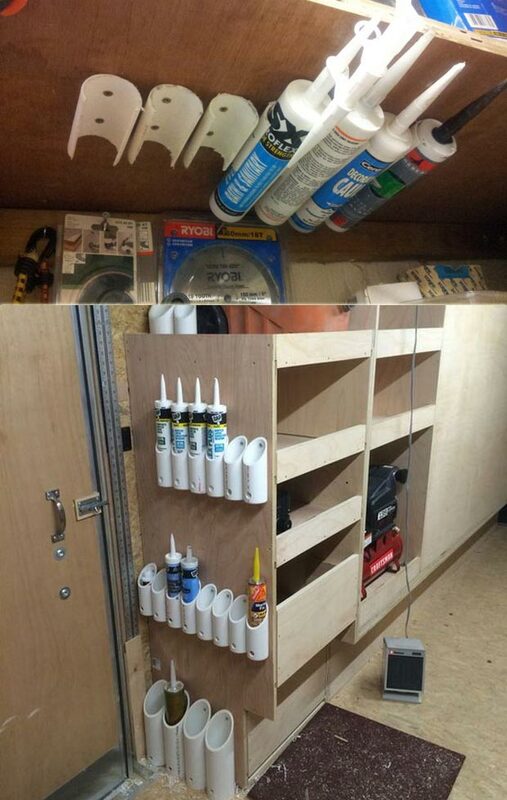 No wall space to store your tools? You can build peg board slides to store them vertically inside of a cabinet. Wooden shovel rack, PVC pipe tool holder and pallet handled tool rack, they are all simple and almost no money ideas for your garage organization. See the full tutorial for “PVC pipe tool holder” here; and step-by-step guide about “Wooden shovel rack” here! 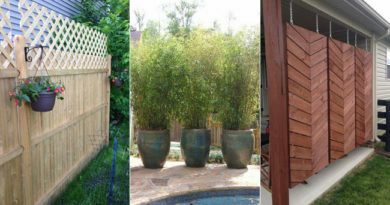 To finish this project is easy, you just need to drill a few holes on a piece of scrap wood and cut brackets for mounting. Check out the full tutorial here. Roll the cabinet out when you need something and keep it closed when you do not use them. for the more details visit here. Made from 40 mm plastic pipe, the pipes measure 70, 120,170 and 220 mm respectively. The image source found here. 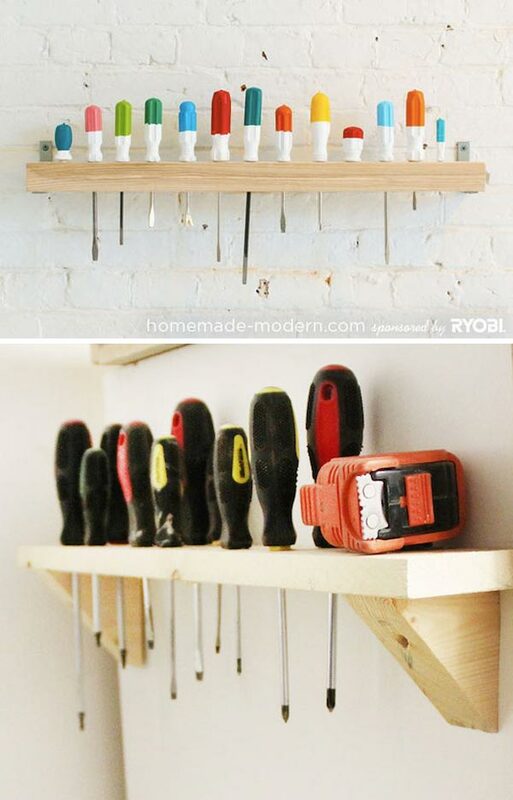 Check out the full instructions and details for the DIY suspended shelving project here. 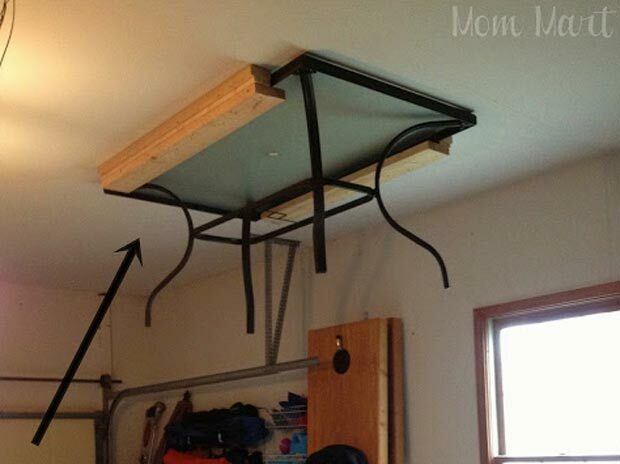 A few plastic bins and a tracking system will instantly turn your garage ceiling into the perfect storage. 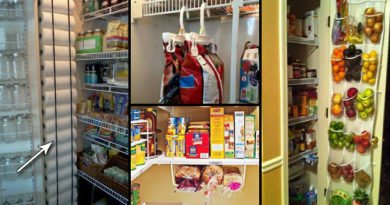 See the full guide for “Sliding Storage System” here. 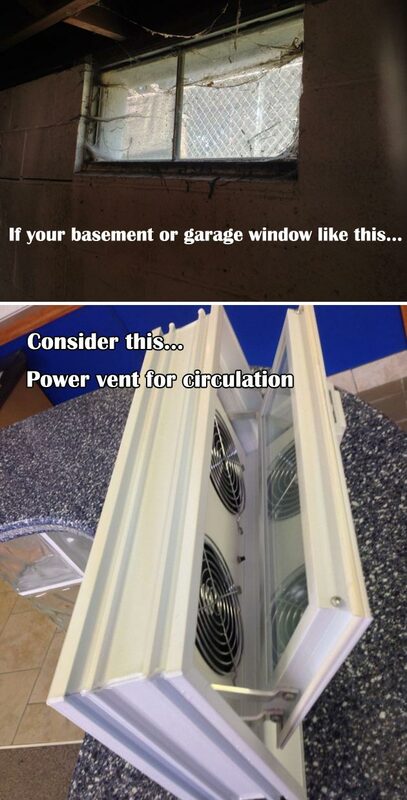 Adding a power vent in a glass block window is a clever way to resolve bad circulation for a basement or garage: Get the more details here. 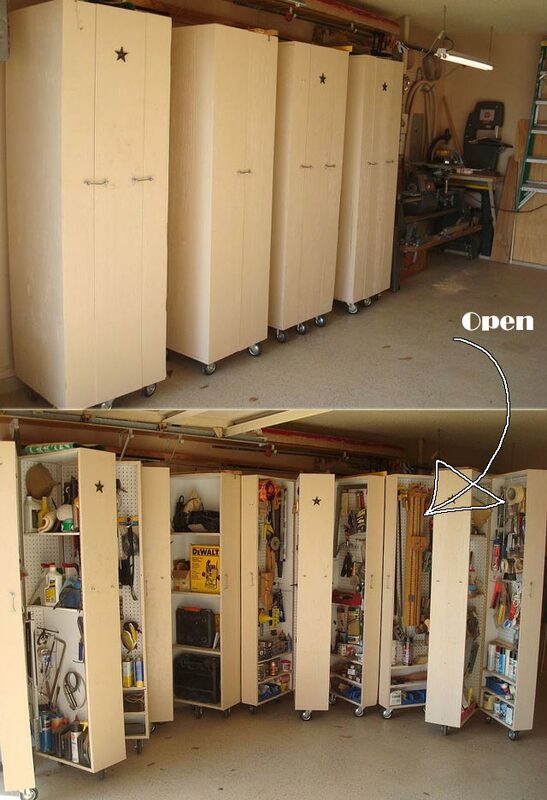 If you are lack of space for a mudroom in your home, then you can build one in the garage. While you’re at it, put in a little bench with basket storage or a shoe cubby, and you’re set!